You can buy Bitter Root, Sweet Fruit from Gerakbudaya or MPH. 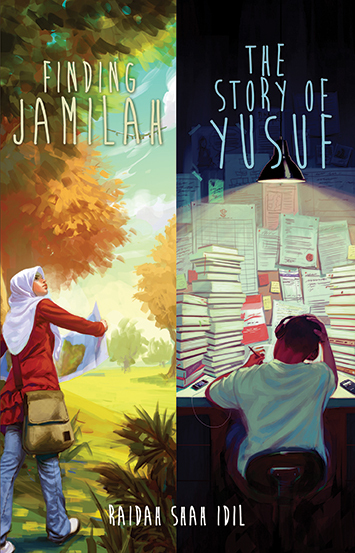 You can buy Finding Jamilah and The Story of Yusuf from Amazon’s Kindle store. Jamilah Henderson knows three things: her mother is invincible, her hamster can’t stay still, and no matter how much she tries, she won’t fit in. When tragedy strikes her family, her world turns upside down. Will she heal the twenty-year rift between her grandparents and her parents? Finding Jamilah is a story about love, identity, and the gift of forgiveness. “Nothing has a stronger influence psychologically on their environment, and especially on their children, than the unlived life of the parents.” – Carl Jung. Yusuf Mohamed is in his final year of highschool, and the stakes are high. The pressure is on for him to excel, and to be the doctor that his father always wanted him to be. Truth be told, Yusuf doesn’t want to be a doctor. He wants to be the opposite of the medical or anatomical; he wants to be a poet and explore metre and rhyme. How will he reconcile his dreams and his father’s? I *love* the cover of your book, Raidah! Congrats on getting your book published. May it be the first of many to come. Ameen. Can i find this book in kinokunia KLCC or popular bookstore or any MPH bookstore in malaysia? Free worldwide-shipping ??? can you fly one of those to russia please ?? ?